There are two things in Tiger & Bunny that one just doesn’t seem to be able to escape, and fried rice is one of them. 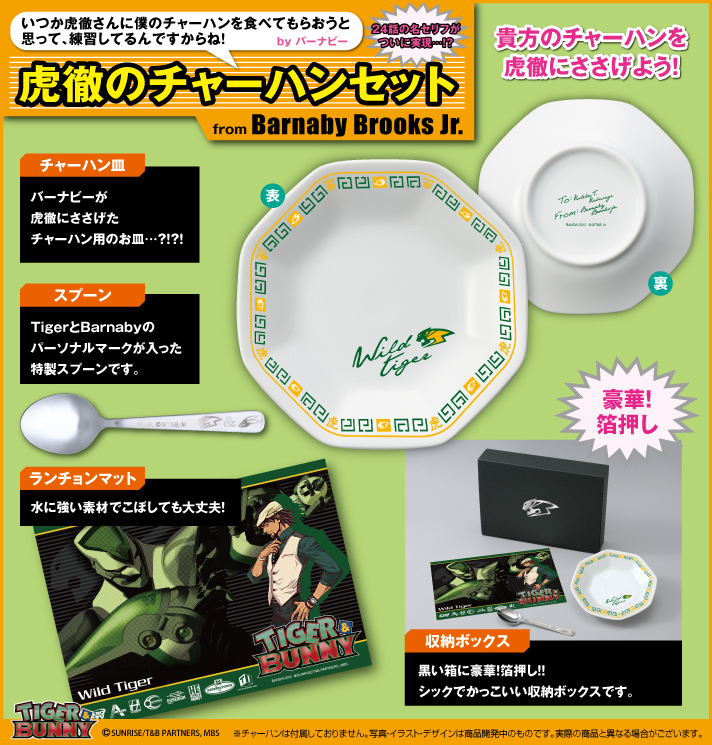 Recently, Bandai announced this fried rice set from Barnaby to Kotetsu that’s available on Premium Bandai. It was also featured in detail on Bandai Namco’s “Item Thursday” shopping program webcast, where the presenter read an excerpt from Nishida Masafumi’s blog post about the fried rice line in episode 24. Yeah, the same post that he made about Friend Rice Event Gallery. They didn’t mention the event itself in the program, but ever since then I’ve been wondering if the photos that everyone sent have contributed to stuff like this fried rice set being made. Rumour also has it that the planned Kotetsu and Barnaby Chibi-arts have fried rice plates as accessories. The fried rice line is pretty popular also in Japan, it came in first among Barnaby’s lines in the King of Catchphrases poll that was held for Hero Awards 2011. And by the way, the Friend Rice Event Gallery still gets a steady daily traffic mostly from Japan. Like I was told on Twitter, maybe we have brought this poverty on ourselves now that they’re making all this fried rice merchandise. I regret nothing, even though my wallet has a seizure every month. Arranging the event was tons of fun. Oh, the other thing you can’t escape? Barnaby’s speedo. Just wait for Summer and there’ll be an official version of that speedo for sale and ready for sandy beach sandy beach~ ♪. I’m calling it. i would be shocked if it ACTUALLY sold out. then we will be seeing cosplay photos of people who have that set. I regret nothing. Friend rice was fun. Tho, I have been wondering if I should make a new bank account just for my T&B merch, so I could see how much I have spent on them… but the thought scares me quite a bit. I made a spreadsheet of my T&B spending. It’s a bit scary, thanks to the horrible shipping costs. Still… I wouldn’t want any of that money back. I didn’t even count doujinshi on my spreadsheet. I actually haven’t even bought much doujinshi, there’s more than enough official merch to satisfy my needs (and I’m picky as hell about the doujinshi I buy). Money and Space….I wish I could have it all! We held the event but everyone who took part in it made it huge.